Congratulations to Georgina Field , winner of a local logo design competition. 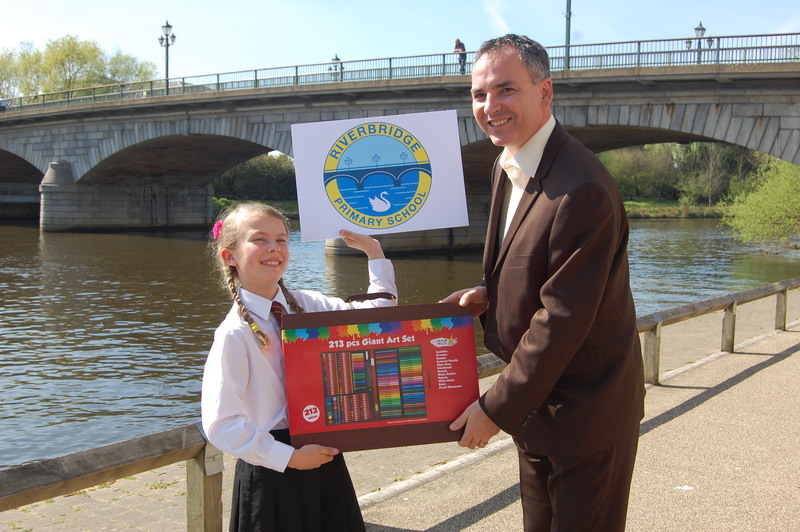 Pupil power was demonstrated graphically this week as the new brand logo for Riverbridge Primary School was unveiled at Staines Riverside. Riverbridge Primary School is the new school name which combines the three existing schools; Knowle Park School, Kingscroft Junior School and Shortwood Infants Schools. Each school announced the logo design competition to their pupils at the beginning of March and received over 500 entries. The winning logo design was created by 9 year old Georgina Field, a pupil of Kingscroft School whose winning concept for the new combined school features an iconic swan (a symbol for Staines) passing by the three arches of Staines Bridge. Staines-based website design and branding agency, Design Incorporated, provided their services free of charge – providing branding guidance to the judging panel and converting the winning entry from pencil drawing to digital artwork.